To switch to full screen or manually control slides, use the controls below the presentation. With ScanNav, prepare your next coming cruises at home by examining maps, create waypoints, routes, calculate distances... After your navigation, continue enjoying your trip by analyzing all details of your track that will have been memorized on your pc. Charts: You can use commercial charts or create your own charts from a simple desktop scanner, or even correct any existing raster charts. 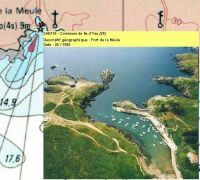 Navigation: Plug your GPS and other NMEA instruments, and your boat will be positioned real time on the map, keeping track of all your movements and giving you all navigation information. SnTides which is based on the SHOMAR engine will provide water levels with a worldwide coverage. These are the Official vector charts issued directly from the different nations' Hydrographic Offices, according to the SOLAS convention for human safety at sea. They are available by custom selection of individual charts, and can be downloaded with any Internet connection, including low-speed. This raster charts offer is derived from data provided by the SHOM (France), UKHO (United Kingdom+Irlande, Spain+Portugal, Croatia, Belgium+Netherlands), Shom+UKHO+Noaa for the Caribbean, and Navimap for Italy. Charts are updated twice a year. Although the look is similar, they are not scanned from paper charts, but issued from the printing films, which eliminates manipulation errors, and facilitates regular updates. This offer requires ScanNav version 12.1 or higher, or ScanNav Compagnon for Android. ScanNav is also suitable for inland navigation with Inland ENCs distributed by the VNF (French Waterways), and equivalent services from other countries. Web layers also superimpose perfectly geo-referenced satellite images. ScanNav also supports Lambert and UTM projections used for terrestrial mapping, and can therefore also be used in this area (hiking, mountain biking, 4x4 raids ...).